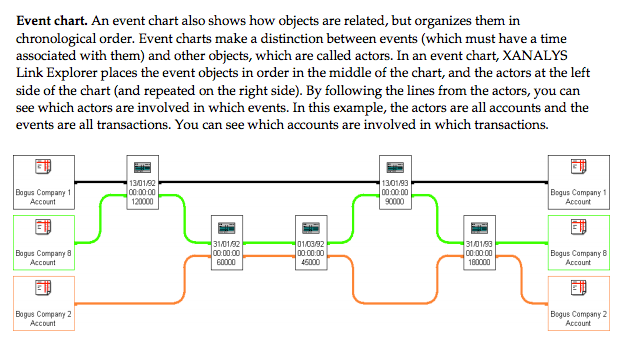 Data Structure + Narrative Chart = StoryLine? 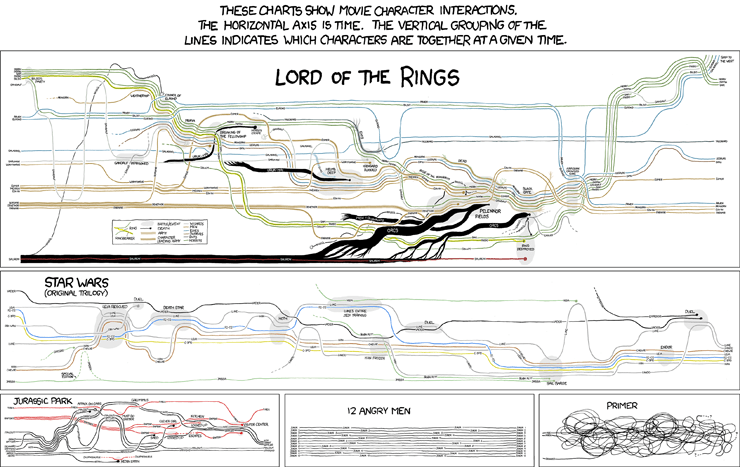 A couple of years ago, prompted by a query from Michael Smethurst/@fantasticlife (then of the BBC, now of UK Parliament), I put together a post that described several ways for visually exploring the structure of a story or narrative – Narrative Charts Tell the Tale… (see also: From Storymaps to Notebooks). The data is supplied in two data files: an XML file that identifies the characters, and a JSON file that contains a list of scenes, with each scene comprising a set of characters associated with the scene. 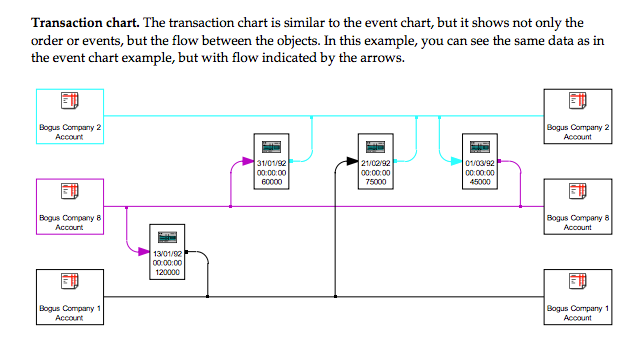 The code for that demo is available here – Github/abcnews/d3-layout-narrative (also check out the interesting way in which they annotated the source – and described in the post Automating XKCD-Style Narrative Charts. The list order of scenes appears to define the order in which they appear in the chart. A more recent chart captures the storylines of all the Start Wars movies – the different coloured threads are perhaps a useful device for highlighting players in a political story, or distinguishing teams or players in a sports based storyline? Again, the structure of the data is based around characters and scenes, with additional metadata elements. The rendering of the charts – from which we can read the story and get an idea of the flow of events – is simply a visual realisation of the way the data is structured an ordered in the data. There are two ways to approach this: first, I could just try to create some data files. Second, I wonder if I could text mine some race reports, treat each paragraph as a possible event, extract driver names (and perhaps even event keywords?) from the each paragraph, and then render the race report down as a narrative chart data file? And then start to iterate, improving the race report parser on the one hand, and building story trope generators (and detectors) into the timing sheet analysis in order to generate storylines automatically? That is, can we use the narrative chart data format as in intermediary representation for picking apart and analysing human generated race reports, and as a target for automated storypoint identification routines? See also: Notes on Robot Churnalism, Part I – Robot Writers. Author Tony HirstPosted on March 26, 2016 Categories Anything you want, VisualisationTags xkcd3 Comments on Data Structure + Narrative Chart = StoryLine? A couple of interesting devices for trying to engage folk in a data mediated story. First up, a chart that is reminiscent in feel to Hans Rosling’s ignorance test, in which (if you aren’t familiar with it) audiences are asked a range of data-style questions and then demonstrate their ignorance based on their preconceived ideas about what they think the answer to the question is – and which is invariably the wrong answer (with the result that audiences perform worse than random – or as Hans Rosling often puts is, worse than a chimpanzee; by the by, Rosling recently gave a talk at the World Bank, which included a rendition of the ignorance test. Rosling’s dressing down of the audience – who make stats based policy and help spend billions in the areas covered by Rosling’s questions, yet still demonstrated their complete lack of grasp about what the numbers say – is worth watching alone…). Another display demonstrates the general understanding calculated from across all the submissions. It also reminds me that I never got round to trying to the Knight Lab Storymap.js with a zoomified/tiled chart image as the basis for a storymap (or should that be, storychart? 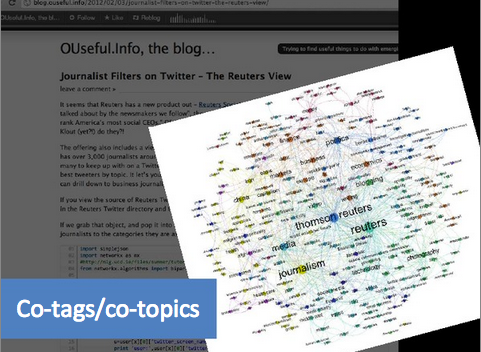 For other storymappers, see Seven Ways to Create a Storymap). I just paid out the $19 or so for a copy of zoomify to convert large images to tilesets to work with that app, though I guess I really should have tried to hack a solution out with something like Imagemagick (I think that can export tiles?) or Inkscape (which would let me convert a vector image to tiles, I think?). 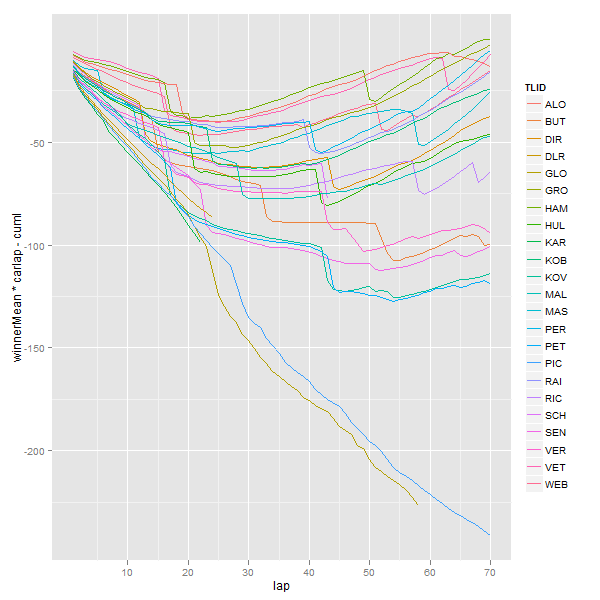 Anyway, I just need a big image to try out now, which I guess I could generate from some F1 data using ggplot? A couple of days ago, I got a message from @fantasticlfe asking if I’d done any tinkerings around what turned out to be “narrative charts”. I kept misapprehending what he was after (something to do with continuity?! ;-), so here’s a summary of various graphical devices for looking at narrative texts that we passed back and forth, along with some we didn’t.. In this chart, we have time along the horizontal x-axis. 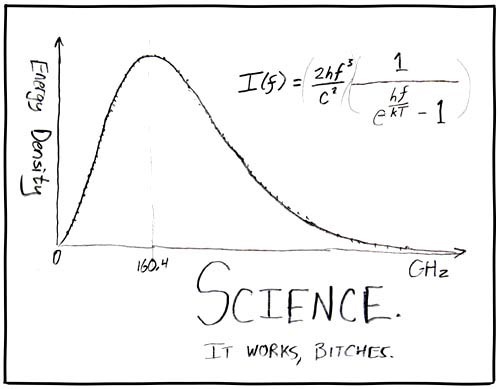 The y-axis is ambiguous (some sort of nominal ordering?) and the line thickness appears to represent army size. However, in the case of Minard’s chart (which I personally don’t like at all! ), the x-y and co-ordinates represent map co-ordinates – the thick lines aren’t thick lines in a line chart (which a glanced “up and to the right” view might make you assume), they’re flow lines across a map. I got distracted for a while by the Sankey aspect, and dug around my own bits of code. For example, Generating Sankey Diagrams from rCharts, an rCharts wrapper for the d3.js Sankey diagram. Michael was particularly interested in being able to group lines vertically (though I wasn’t sure what the y-axis would actually correspond to: some loose function of “location”, maybe as a categorical variable? Time was definitely to be on the horizontal x-axis); a posting on Stack Overflow (d3 sankey charts – manually position node along x axis) seemed likely to be able to help with that. 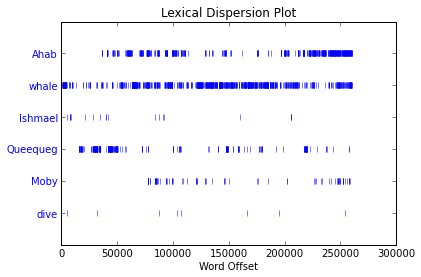 Would a variant of nltk style lexical dispersion plots help, using characters rather than word categories? That would show when a character was in scene, but not much else? How about sentence drawing, in which we show “turns” taken by different speakers? Hmmm… Michael wanted to be able to look at scenes on x and presumably some function of location on y. Hmm… why? And how might we actually order those axes? Scenes occur in order in a film or play, but scene is a ranked, ordinal value. That said, scenes also have duration in terms of screentime, which may or may not be the same as the “interval” that the scene portrays in terms of the world it represents (this must have a name? eg a 20 second screen time scene shows a plane flying and this represents x hours in the story). The scene may also have a ‘calendar time’ associated with it in the story – so where you have a flashback scene this corresponds to a previous calendar time in the represented world. Did Michael want any of these dimensions capturing? Related to shapes of stories, here’s how someone analysed several thousand plots: Examining the arc of 100,000 stories: a tidy analysis. And then there’s location… how should these be represented? Locations are a distance apart and, perhaps more importantly from a continuity point of view, a travel time apart; as well as maybe a timezone difference apart. Did that need capturing in any way? Ordering axes for this could be quite hard if we wanted close things in space (distance? travel time?) to be close together on a single axis (A is 10 minutes from B and C, B is ten minutes from C: how do you show that intransitive relation on a single dimension? [Maybe relevant? Storygraph: Extracting patterns from spatio-temporal data, A Shrestha et al., Advances in Visual Computing.] Hmm… If we can capture distance between locations, and some sensible notion of time relating to scenes, could we maybe use line thickness to show that a person has lots of time to move between one (time, location) and another, as compared to scenetime? Do filmwriters have tools to support this? Do the police…?! Is the Mythology Engine relevant? How about thinking about it as a graph? 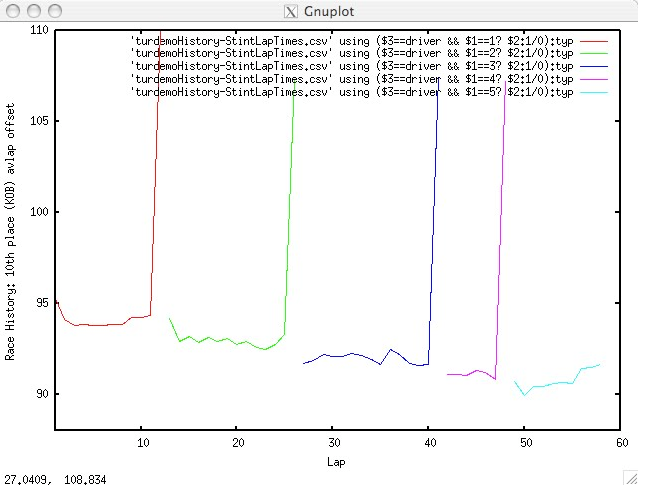 I’ve used Gephi before as a foil for getting me to think about ordered series as connected events in a graph – for example, Visualising F1 Timing Sheet Data. If we encode scene number as the x-coordinate and location number as the y-coordinate, with each graph line being the connected series of scenes a particular individual is in, then we can simply use a line chart to connect “individual lines” to different scene and location numbers. We’d also have a couple of extra dimensions to play with – node size and node colour, at each location. We’d also have the opportunity to play with edge (that is, line) colour and edge thickness? There’s also an animation of event in Game of Thrones, but I can’t quite figure out how to read it?! Let’s go back to the sort of thing Michael was after – narrative charts.. Hovering over these charts, I noticed they were interactive d3.js charts. A quick View Source and the code for generating the chart dynamically from a characters file and a narrative file appeared to be there. Which I think is what Michael wanted all along…! PPS some more bits: @r4isstatic points to Some visualisations of stories and narratives, another summary post similar to this one. Also via Paul Rissen, and picking up on whether the police have any interesting actor/event/time/location diagramming techniques, Vispol – An Interactive Scenario Visualization. Elsewhere, I find Storyline Visualizations, which includes a paper (Design Considerations for Optimizing Storyline Visualizations, Y Tanahashi, and K-L Ma, IEEE Trans on Visualisation and Computer Graphics, 18(12) 2012, pp2679-2688 and some python code. The Chart Equivalent of Comic Sans..? Whilst looking at the apparently conflicting results from a couple of recent polls by YouGov on press regulation (reviewed in a piece by me over on OpenLearn: Two can play at that game: When polls collide in support of a package on the OU/BBC co-produced Radio 4 programme, More Or Less), my eye was also drawn to the different ways in which the survey results were presented graphically. The polls were commissioned by The Sun newspaper on the one hand, and the Media Standards Trust/Hacked Off on the other. If you look at the poll data (The Sun/YouGov [PDF] and Media Standards Trust/YouGov [PDF] respectively), you’ll see that it’s reported in a standard format. (I couldn’t find actual data releases, but the survey reports look as if they are generated in a templated way, so getting the core of a generic scraper together for them shouldn’t be too difficult…) But how was that represented to readers (text based headlines and commentary aside? Pie-charts in 3D, with a tilt… gorgeous… erm, not… And the colour choice for the bar chart inner-column text is a bit low on contrast compared to the background, isn’t it? It looks a bit like the writer took a photo of the print edition of the story on their phone, uploaded it and popped it into the story, doesn’t it? So what I’m wondering now is the extent to which a chart’s “theme” or style reflects the authority or formal weight we might ascribe to it, in much the same way as different fonts carry different associations? Anyone remember the slating that CERN got for using Comic Sans in their Higgs-Boson discovery announcement (eg here, here or here)? Things could hardly have been more critical if they had used CrappyGraphs or an XKCD style chart generator (as for example described in Style your R charts like the Economist, Tableau … or XKCD ; or alternatively, XKCD-style for matplotlib). Oh, hang on a minute, it almost looks like they did! The chart annotations are also rather clearer to read. PPS As far as bad charts go, they may also be, misrepresentations and underhand attempts at persuasion, graphic style, are also possible, as SimplyStatistics describes: “The statisticians at Fox News use classic and novel graphical techniques to lead with data” [ The statisticians at Fox News use classic and novel graphical techniques to lead with data ] See also: OpenLearn – Cheating with Charts. Author Tony HirstPosted on December 3, 2012 December 3, 2012 Categories Infoskills, Visualisation1 Comment on The Chart Equivalent of Comic Sans..? its the Gramma an punctuashun wot its’ about, Rgiht? Reading Alan’s post, it occurred to me that once you get the idea of using a solid or semi-transparent solid filled background to a text label, you tend to remember it and add it to your toolbox of presentation ideas (of course, you might also forget and later rediscover this sort of trick… My own slides tend to crudely follow particular design ideas I’ve recently picked up on, albeit in a crude and often not very well polished way, that I’ve decided I want to try to explore…) In the slide above, several tricks are evident: the solid filled text label, the positioning of it, the backgrounded blog post that actually serves as a reference for the slide (you can do a web search for the post title to learn more about the topic), the foregrounded image, rotated slightly, and so on. The thing that struck me about Alan’s post was that it reminded me of a time before I was really aware of using a solid filled label to foreground a piece of text, which in turn caused me to reflect on other things I now take for granted as ideas that I can draw on and combine with other ideas. In the same way we learn to spell, and learn to use punctuation, and start to pick up on the grammer that structures a language, so we can use those rules to construct ever more complex sentences. Once we know the rules, it becomes a choice as to whether or not we employ them. 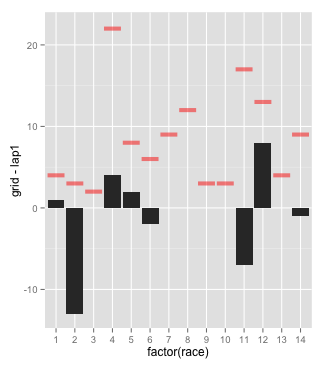 I didn’t know what to call the chart, but thought it should be easy enough to try to wrangle one together using ggplot in R, guessing that a geom_errorbarh() might work; Mat came back suggesting geom_crossbar(). 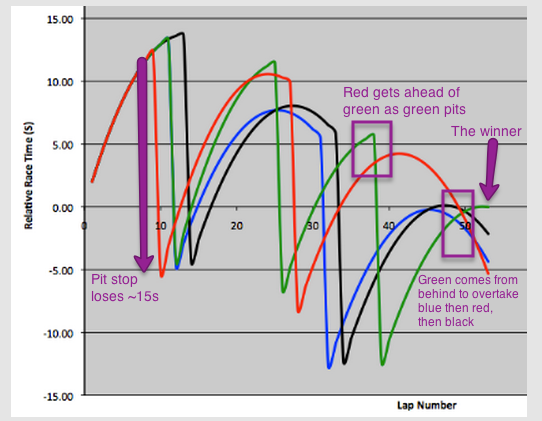 Three stops is actually faster [taking new softs on lap 12], as the [upper] graph … shows, but it requires the driver to pass the two stoppers in the final stint. If there is a safety car, it will hand an advantage to the two stoppers. So, can you see why the three stopper (the green line) “requires the driver to pass the two stoppers in the final stint”? Let’s step back for a moment – can you see which bit of the graphs represent an overtake? This is actually quite a complex graph to read – the axes are non-obvious, and not that easy to describe, though you soon pick up a feeling for how the chart works (honest!). 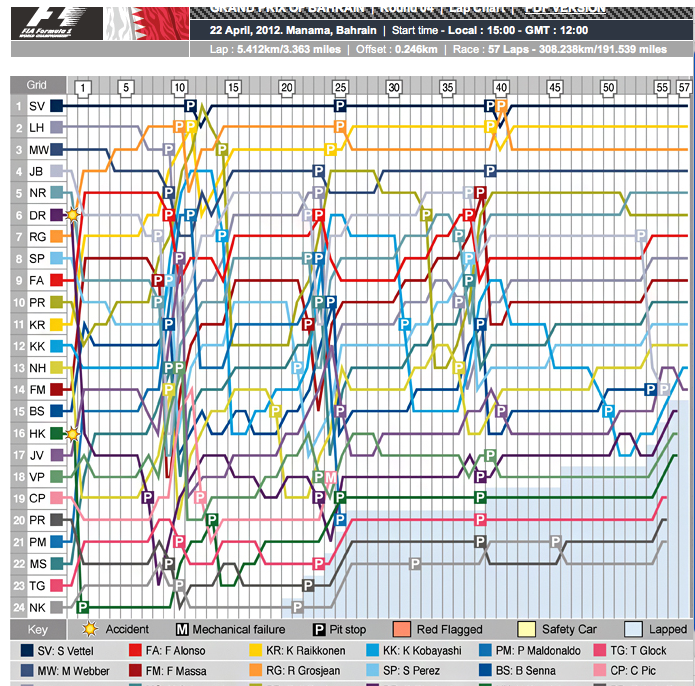 Getting a sensible interpretation working for the surprising feature – the sharp vertical drops – is one way of getting into this chart, as well as looking at how the lines are postioned at the extreme x values (that is, at the end of the first and last laps). Whatever the case, one of the ideas I always have in mind is whether it may be possible to introduce white space in the form of a break in a line in order to separate out different groups of data in a very simple way. Over the summer, an episode of one of my favourite audio/radio programmes, the OU co-produced Radio 4 programme More or Less included a package on high frequency trading. To illustrate how fast high frequency trading works, the programme used a beautiful bit of sonification (the audio equivalent of a graphical data visualisation). You can listen to it on iPlayer here: How fast is high-frequency trading? A couple of weeks prior to the More or Less programme (coincidence? Or inspiration?) a blog post about a data sketch done by NYT’s incredibly creative Amanda Cox referred to a similar audio technique to illustrate(?!) close finishes in sprint races: Why Amanda Cox should be in charge of audio. The post also referred back to a New York Times piece from February 2012 capturing just how closely some of the 2010 Winter Olympics race finished: Fractions of a Second: An Olympic Musical. So now I’m wondering – have you ever seen, erm, heard a presentation that has used audio, rather than graphics, to illustrate a data story? See also: Robot wars: How high frequency trading changed global markets. Both of these charts can be used to illustrate the progression of a race, and even in some cases to identify stories that might otherwise have been missed (particularly races amongst back markers, for example). For Olympics events particularly, where reporting is often at a local level (national and local press reporting on the progression of their athletes, as well as the winning athletes), timing data may be one of the few sources available for finding out what actually happened to a particular competitor who didn’t feature in coverage that typically focusses on the head of the race. One of the ways of using this chart is as a quick summary of the race position chart, as well as a tool for highlighting possible “driver of the day” candidates. All of these charts can be calculated from lap time data. Some of them can be calculated from data describing the position held by each competitor at the end of each lap. But whatever the case, the data is what drives the visualisation. Here, the NYT have given split data showing the times achieved in each leg by the relay team members, along with a lap chart that has a higher level of detail, showing the position of each team at the end of each 50m length (I think?!). 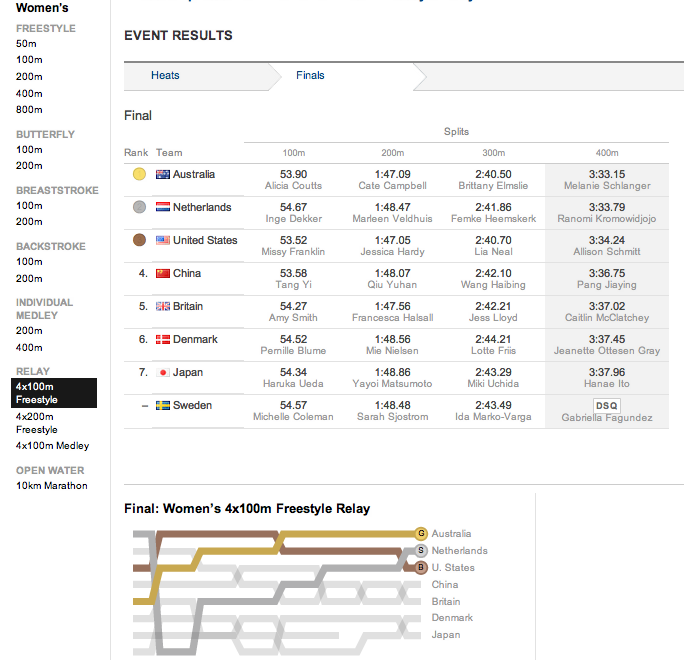 The progression of each of the medal winners is highlighted using an appropriate colour theme. The chart provides an illustration that can be used to help a reporter identify different stories about how the race progressed, whether or not it is included in the final piece. The graphic can also be used as a sidebar illustration of a race report. PS for an example of the lapcharting style used to track the hole by hole scoring across a multi-round golf tournament, see Andy Cotgreave’s Golf Analytics.